A general log-likelihood specification is used in the MODEL statement to specify the preceding log of the Weibull density. The linear combination of the parameters, b to b , and the two random effects, RatEff and SampEff, is defined using the linear predictor MU in the first SAS programming statement. Then, the next two SAS programming statements together define the log of the Weibull density function. The first RANDOM statement defines the first level of the random effect, , by using RatEff. Then, the second RANDOM statement defines the second level of the random effect, , nested within the first level by using SampEff. Both random-effects distributions are specified as normal with mean 0 and variance sd1 and sd2 for the first and second levels, respectively. The selected output from this model is shown in Output 70.7.1, Output 70.7.2, and Output 70.7.3. The "Specifications" table shows that RatEff is the first-level random effect, specified by the subject variable Rat, and it follows a normal distribution (Output 70.7.1). Similarly, SampEff is the second-level random effect, nested in RatEff and specified by the subject variable Sample, and it follows a normal distribution. The "Dimensions" table indicates that 4,050 observations are used in the analysis (Output 70.7.2). It also indicates that there are 27 rats and that 81 samples are nested within the rats. As explained earlier, three samples are selected randomly from each rat, so a total of 81 (27 times 3) samples are used in the analysis. The "Parameter Estimates" table list the maximum likelihood estimates of the parameters along with their standard errors (Output 70.7.3). The estimates are fairly close to the estimates that are given in Ghebretinsae et al. (2013), who use a gamma distribution for the Sample random effects instead of the normal distribution as in the preceding model. Note that the parameters , , and represent the effects of low, medium, and high doses, respectively, when compared to the vehicle control. Similarly, is the parameter that corresponds to the effect of positive control when compared to vehicle control. The p-value indicates that the point estimates of all these parameters, to , are significant; this implies that the toxicity of 1,2-dimethylhydrazine dihydrochloride is significant at different dose levels. The parameter estimates that are obtained from the nested Weibull overdispersion model are given in Output 70.7.1. The "Parameter Estimates" table indicates that the point estimates are still significant, as they are in the previous model in which the overdispersion is not taken into consideration. So the same conclusion about the dose levels holds: the toxicity of 1,2-dimethylhydrazine dihydrochloride is significant at different dose levels. The resulting plots are given in Output 70.7.5. 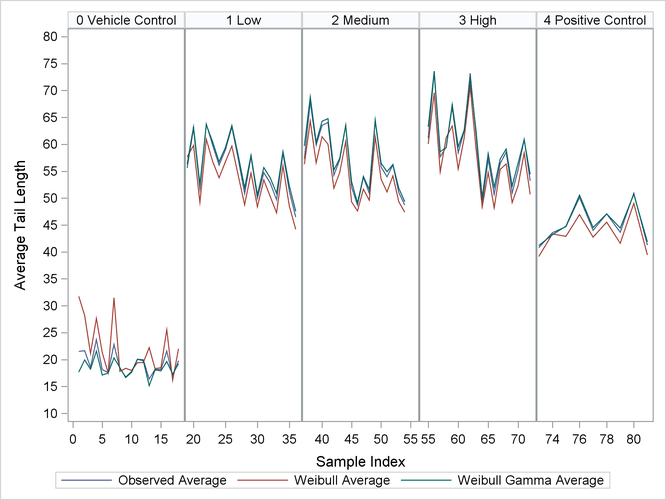 You can see from the plots that the observed averages of the tail lengths from each sample that is nested within a rat are closer to the predicted averages of the nested Weibull overdispersion model than to the predicted averages of the nested Weibull model.